Two people who unhappy with their shapes eventually conclude that they can be happy with their shapes. There are many other shapes to see and discuss too. 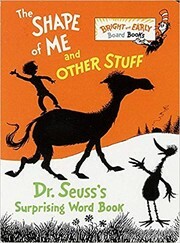 Seuss, Dr., “The shape of me and other stuff,” Children's Picture Book Database at Miami University, accessed April 22, 2019, https://dlp.lib.miamioh.edu/picturebook/items/show/10430.